When you need to chill, ice cream floats are your friend. Like a seven-layer dip after five minutes with a chip-wielding mob, the ice cream float is at its best when it looks a mess. 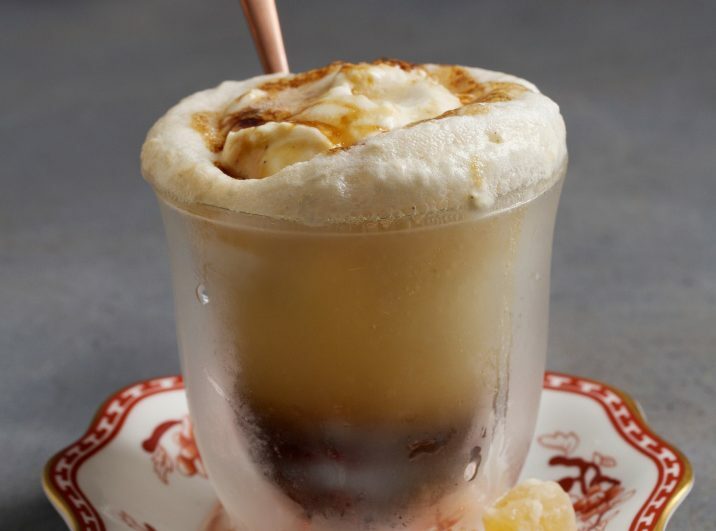 That chilled scoop needs to meld into what’s in the glass, creating a foamy head, a likely puddle below and the kind of creamy drink that was intended when the float, aka ice cream soda, was invented in the 1870s. You might think a written recipe amounts to overkill. What does it take beyond ice cream, soda, straw and spoon? Well, a little extra attention to ingredients pays off. 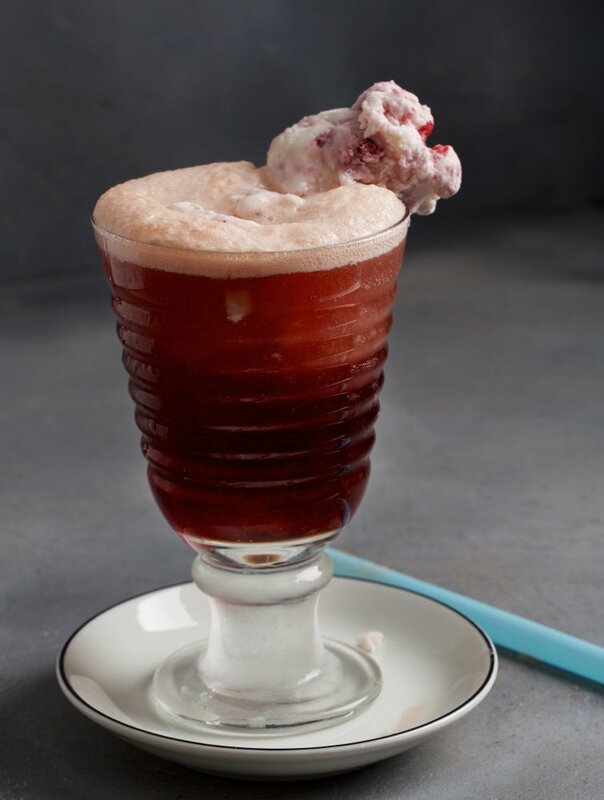 Stirring flavored syrup into plain seltzer makes for a soda that’s less sweet than what you can find on the soft drinks aisle, and that custom blending comes in handy for a tasteful balance once the ice cream goes in. There are plenty of syrups on the market, but for some reason they come in 750-milliliter bottles, which is way more than you need for even a party-size batch o’ floats. It’s easy enough to make your own syrups by simply boiling down a pure fruit juice or infusing a classic sugar-and-water mix. When you go the boozy route, keep in mind that a strong-tasting concoction will be mellowed considerably. Consult a guide such as “The Flavor Bible” to experiment with flavor affinities and complementary notes in spirits and bitters. The scoop you choose matters, too, of course. Gelato will melt faster than premium ice cream, but it has a bit less fat and may result in a different mouthfeel. Sorbets, which are typically nondairy, won’t yield a surface that’s quite as foamy. You might not want to choose ice cream with chunks that would get stuck in a straw. But do venture beyond simple vanilla and chocolate. Finally, there’s the presentation. 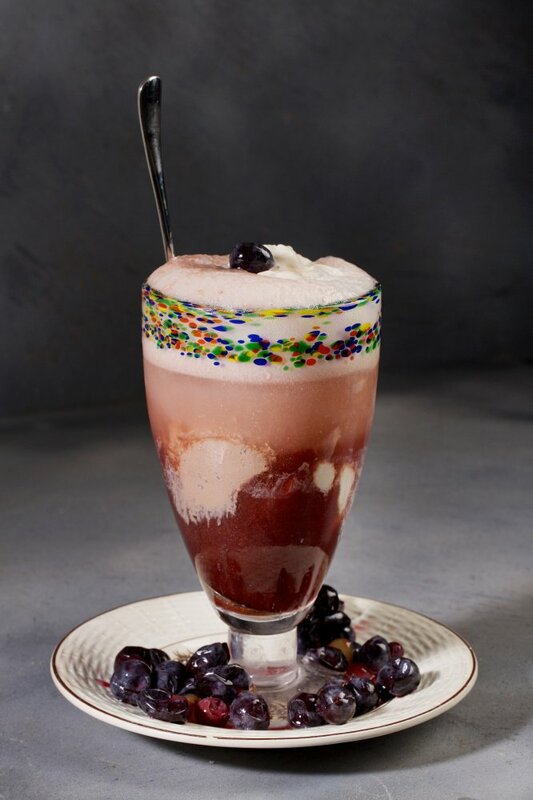 The folks behind the Brooklyn Farmacy & Soda Fountain recommend the made-to-order technique used in their Carroll Gardens neighborhood shop: Stir the syrup and seltzer mixture in each tall glass, leaving a generous amount of headspace. Perch the scoop of ice cream on the rim, then fill with more seltzer just until the level of liquid meets the scoop and bubbles form. Blending and melting will ensue with some control, as you drink and stir. Sure enough, some ice cream will run down the side of the glass, and soon the scoop will fall in and bob on the surface. That’s why you serve an ice cream float on a saucer plate. Start with this batch of floats for inspiration, and invest in a few long spoons. Sure, you could use your favorite ginger ale here. But we found that we preferred this drink, which is packed with ginger flavor and is not as sweet as a store-bought ginger soda. It’s best to chill your glass, preferably 16-ounce, in the freezer for about 15 minutes before serving. You can save time by using a good-quality store-bought syrup, such as Morris Kitchen (available at Dean & DeLuca) or Ginger People Organic Ginger Syrup, available online and at some Whole Foods Markets. The homemade syrup can be refrigerated for up to 1 week. Based on a recipe from “The Soda Fountain: Floats, Sundaes, Egg Cream and More,” by Gia Giasullo and Peter Freeman with Elizabeth Kiem and Nelle Gretzinger (Ten Speed Press, 2014). For the syrup: Combine the cup of chopped ginger, the sugar and water in a medium saucepan over medium-high heat. Once the mixture begins to boil, stir until the sugar has dissolved. Reduce the heat to medium-low, cover and cook for 1 hour. Meanwhile, grate the 1-inch piece of ginger into a small fine-mesh strainer set over a small bowl. Use a wooden spoon to press the ginger solids to extract as much juice as possible (at least 1 teaspoon). Discard the gratings. Uncover the ginger syrup mixture and pour through a fine-mesh strainer set over a heatproof container. Use a wooden spoon to press the solids, extracting as much liquid from them as possible. Discard the solids. Stir in the extracted ginger juice. The yield should be about 2 cups; you’ll need 1/4 cup for this recipe. For the drink: Pour the 1/4 cup of syrup into a tall glass. Add the seltzer to fill up to an inch or so from the top, then stir gently with a long spoon to incorporate. Gently add the pistachio gelato or ice cream, then add the remaining seltzer to fill the glass and create a foamy top. Serve right away, with a straw and a long spoon. Grape and vanilla makes a refreshing flavor combination. Fresh Concord grapes are only around in early fall, so we took the time to boil down grape juice to make the syrup needed here. The syrup can be refrigerated for up to 1 week, or frozen for up to 3 months. For the syrup: Combine the Concord grape and lime juices in a saute pan. Bring to a boil over medium-high heat, then reduce the heat to medium and cook for about 45 minutes, or until the liquid has reduced to a syrupy consistency, and the surface is covered in bubbles. The yield is about 1 cup; you’ll need 1/4 cup for this recipe. Store the rest in an airtight container in the refrigerator (for up to 1 week) or freezer (for up to 3 months). Pour the syrup into a mixing glass. Add about half the seltzer, then stir gently with a long spoon until well blended. Pour into a tall glass, then gently drop in the scoop of ice cream. Add the remaining seltzer to fill the glass and create a foamy top. Serve right away, on a small plate to catch any overflow, and with a straw and a long spoon. Sour cherry syrup is available at Russian/Eastern European markets. Pour the syrup into a tall glass. Add the seltzer to fill up to an inch or so from the top, then stir gently with a long spoon to incorporate. 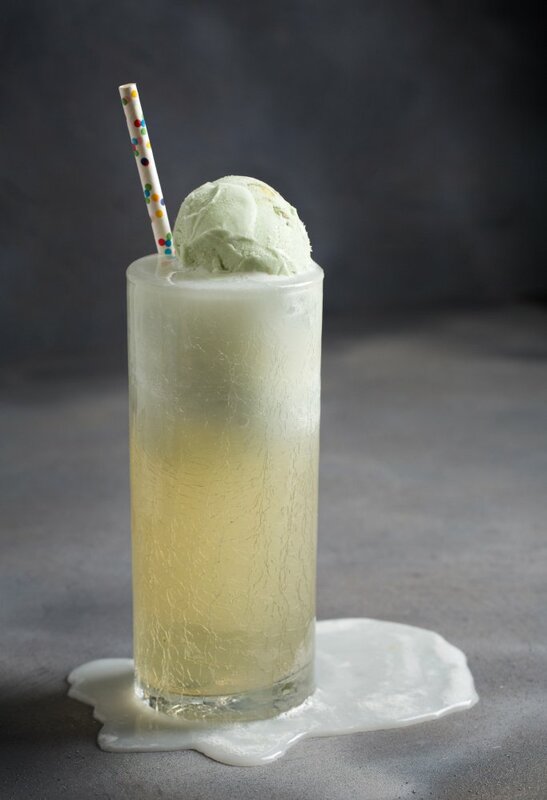 “Hang” the scoop of ice cream on the inside rim of the glass, so the bottom of the ice cream just comes in contact with the seltzer and begins to foam up a bit. Then add the remaining seltzer to fill the glass. Top with a small dollop of whipped cream, if desired. 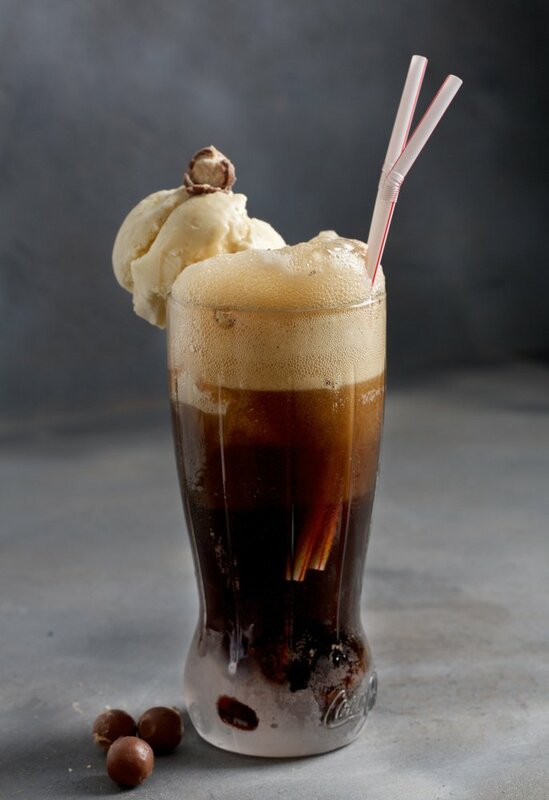 Starting this classic float with a malt syrup seems to boost the root beer flavor here, but you can go without it. Fox’s U-Bet Malt Syrup is available through various online purveyors, including Amazon.com. Adapted from a recipe at Hersheys.com. Pour the syrup, if using, into a tall glass. Add the root beer to fill up to an inch or so from the top, then stir gently with a long spoon to incorporate. Gently drop in the scoop of ice cream, then add the remaining root beer to fill the glass and create a foamy top. Serve right away, on a small plate to catch any overflow, and with a straw and a long spoon. Top with the crushed malted milk balls, if using. Trust us – the more the gelato melts into the drink, the more you’ll appreciate the overall flavor and effect here. It’s best to chill your glass in the freezer about 15 minutes before serving. Adapted from a recipe at SugarandCloth.com. Combine the pomegranate syrup, gin, orange-flavored liqueur and orange bitters in mixing glass, stirring until well blended. Divide between 8-ounce rocks glasses. Add 1 scoop of the gelato to each glass, then gently pour in 1/2 cup of the seltzer. Add a final scoop of the gelato, then gently pour in more seltzer, to fill until foamy on top. Drizzle a little more syrup on top, if desired. Serve right away, with a straw and a spoon.